Feeding poor children in more than 130 countries around the globe, Salesian Missions has launched its Annual Food Distribution Appeal to raise funds to ship donated food to children who are most in need of lifesaving nutrition. Through this special appeal, every $1 that is raised can deliver $20 worth of food. Salesian Missions, the U.S. development arm of the Salesian of Don Bosco, announces the launch of its Annual Food Distribution Appeal to raise funds to ship food aid to malnourished children and families in some of the poorest places on the planet. Through this special appeal, every $1 that is raised can deliver $20 worth of food. This is made possible through ongoing partnerships with food aid organizations like Stop Hunger Now and Feed My Starving Children. Combined with donor contributions to the food appeal, this allows for the delivery of lifesaving food to Salesian programs around the globe. Once there, missionaries work to ensure it is safely and efficiently distributed to those most in need. Also making this possible is the fact that Salesian Missions is a trusted recipient of the USAID Ocean Freight Reimbursement Grant program, which enables its Office for International Programs to transport shipments of humanitarian aid and development commodities at low- to no-cost. More than 793 million people across the world go hungry every day, according to the Food and Agriculture Organization. More than 70 percent of food insecure people live in rural areas of Africa, Asia, Latin America and the Near East. Additionally, two billion people lack the vitamins and minerals needed to live healthy lives, according to the World Food Program and the United Nations. Of those who go hungry daily, 98 percent reside in developing countries where there is not only a shortage of food, but major challenges for aid to reach its destination. Working and living in the communities they serve, Salesian missionaries are perfectly positioned to ensure that the distribution of food aid reaches those who need it most. Operating primary schools, technical training centers, agricultural schools, youth centers, orphanages and programs for street children, Salesian missionaries are on the front lines of the battle against hunger. In fact, Salesians operate more than 5,300 primary and secondary schools that serve more than a million students worldwide. “Salesian missionaries are an integral part of the existing infrastructure in many countries and Salesian Missions plays an important role in making sure aid from the United States reaches its destination country and gets into the hands of those who need it most,” says Father Mark Hyde, executive director of Salesian Missions. Salesian food programs provide meals to students during the school day and serve as an incentive for families to send their children to school. As a result of the feeding programs, students are thriving. Many have gained weight, suffered fewer illnesses and become more focused on their studies. Teachers are seeing better student performance in class, a decrease in absenteeism and an increase in program enrollment rates as a result of the feeding program. The impact of Salesian feeding programs can be seen places like Monrovia, Liberia, where the Ebola epidemic has challenged an already-struggling economy. Survivors rely on petty trade to earn incomes that are inadequate to support themselves and their families. Children like 6-year-old Nyumah and his 12-year-old sister (who live in a one-room shack with their widowed mother and grandmother) regularly go hungry, putting their health and futures at risk. 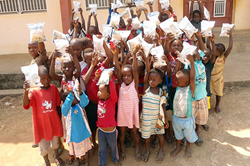 Thanks in part to funds raised by the Annual Food Distribution Appeal, Nyumah and his family now receive a monthly supply of fortified rice-meals, enough to keep the children healthy and engaged in school. The meals were donated by Feed My Starving Children and arrived in September in a 40-foot shipping container filled with 35 pallets containing 1,260 boxes of rice meals each. Coordination of the donation and shipping was managed by the Salesian Missions Office for International Programs and for just $2,000, the cost to ship the donated meals, close to 400 families in Nyumah’s impoverished community have access to healthy nutritious meals. Salesian Missions feeding programs are providing healthy nutrition, preparing youth to better achieve in school and improving health conditions in countries like Liberia, Swaziland, El Salvador, Myanmar and beyond. To raise money for the Annual Food Distribution fund, the Catholic nonprofit aid organization has launched a fundraising campaign and is issuing an appeal for donations. Go to http://www.SalesianMissions.org/food to give. Salesian Missions is headquartered in New Rochelle, NY, and is part of the Don Bosco Network—a worldwide federation of Salesian NGOs. The mission of the U.S.-based nonprofit Catholic organization is to raise funds for international programs that serve youth and families in poor communities around the globe. Salesian missionaries are made up of priests, brothers and sisters as well as laypeople—all dedicated to caring for poor children throughout the world in more than 130 countries. To date, more than 3 million youth have received services funded by Salesian Missions. These services and programs are provided to children regardless of race or religion. For more information, go to SalesianMissions.org.